Dogs are considered the definitive host for heartworms, known by the scientific name of Dirofilaria immitis. However, heartworms may infect more than 30 species of animals, including humans. 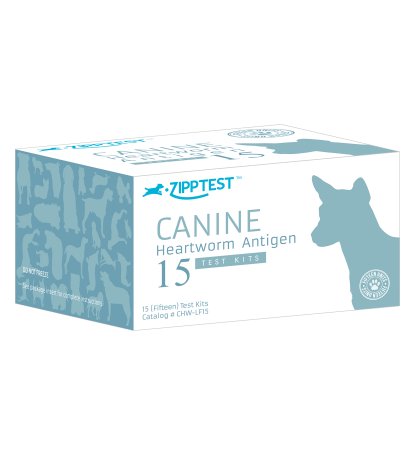 This worm is transmitted when a mosquito carrying infective heartworm larvae bites a dog. The larvae grow, develop, and migrate in the body over a period of several months to become sexually mature male and female worms. These worms reside in the heart, lungs, and associated blood vessels. Even as immature adults, the worms mate and the females release their offspring, known as microfilariae, into the blood stream. The time elapsed from when the larvae enter the dog, until the minute offspring can be detected in the blood (pre-patent period), is about six to seven months. This test is a rapid (10 minute) assay based on the detection of adult female Dirofilaria antigen present in the dog’s serum, plasma or whole blood. The assay uses sensitized gold particles to bind up this antigen and deposit at the test line. The accumulation of this gold particle/antigen complex at the test line results in a band (line) that can be seen visually. A second control line indicates that the test has been performed correctly. A qualified team of professionals with over 30 years of experience, and a proven record of innovation, in the development, manufacture, and marketing of high performance immunoassays. Please use our Contact Form or use the information below to contact us to learn more about our company, products, or services.